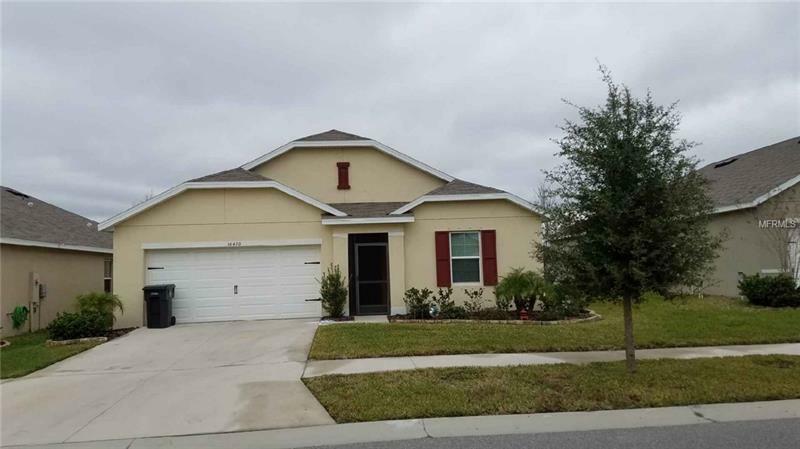 New home built in 2017 in the beautiful Sereno community move in ready 4/2/2 split floor plan wonderfully landscape with sparkling pond in back yard. This appealing one story layout optimizes living space with an open concept kitchen that over looks the living room, dining room and covered screen lanai. The well appointed kitchen has corner pantry and comes with all appliances including refridgerator, built in dishwasher, electric range, and microwave. The owner suites, located in the back of the house for privacy has an suite bathroom with double vanity and large walking closet with reinforced clothing racks. Two other bedrooms at the front of house share a second bathroom. forth bedroom is located just off the foyer. Ceiling fans in every room.Laundry room Is located near the kitchen with plenty of space and storage. Sprinkler system for both front and back lawn. The neighborhood amenities center including open-air clubhouse, pool, tennis, pickle ball and shuffleboard court, playground, dog park, walking trails and golf cart paths will be the heart of the community. Outside the community, US-301 is less than half a mile away and a Walmart is conveniently located right next door. This community is an Ultra-WiFi community and offers smart home technology. This house comes with free internet and hurricane metal shutters for all windows and doors including hurricane proof garage door. This home is a must see! Call for an appointment.